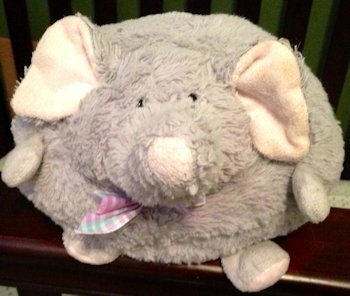 I’m looking for a 2010 Hugfun International elephant we bought that Christmas. I have contacted the company (Hugfun international) who emailed me to let me know it was only distributed to Dollar general stores. The elephant itself is about 8 inches round. It’s a soft polyester, originally a fleecy feel. “Fint” makes my 14 month old’s world go ’round! He absolutely loves him, will not/cannot sleep without him! He has since birth! But Fint gets quite stinky and gets washed twice a week, so he is dying a slow painful death. ebay #261478941454 appears to be an option.